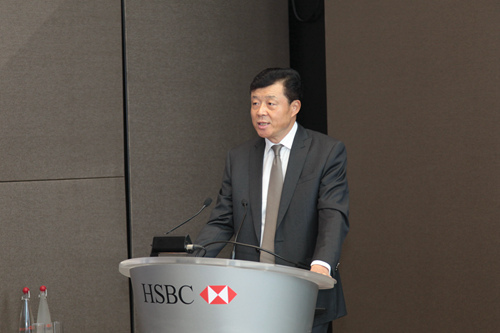 It is a real pleasure for me to speak at this HSBC China Outbound Finance Forum. For China, the outbound finance has a much shorter history than inbound finance. The first three decades of China's reform and opening-up was built on a foundation of very strong inbound investment. Now China is entering a new era where outbound investment is emerging as a powerful trend. This trend began at the turn of the new millennium when China launched major strategic measures for a new round of 'reform and opening up'. That was the catalyst behind China's outbound investment strategy. · A far greater foundation of aggregated national strength. · A more open economy. · And more competitive enterprises. As a result of this strategy, recent years have seen outbound business gaining momentum. Indeed, the record shows China's outbound investment has made making progress by leaps and bounds. · In 2002, China's outbound FDI totaled only 2.7 billion US dollars. · In 2013, it soared to 107.8 billion. · That was a forty-fold increase in a matter of eleven years. · China's outbound FDI flow has been the third largest in the world for two consecutive years. · China's outbound FDI stock of 660 billion US dollars ranks 11th in the world. · There are over 25,000 Chinese enterprises all over the world. · China's outbound non-financial FDI is expected to exceed 120 billion US dollars in 2014. That will overtake the amount of FDI into China in the same period of time. · This will become a milestone in China's outbound investment – China will, for the first time, become a net capital exporter. Such massive outbound activities of Chinese enterprises in recent years bear important characteristics. One aspect is the investments, merge and acquisitions, and operations in Britain. Before the global financial crisis, investment was a one-way traffic from Britain to China. In more recent years, it has gradually become a two-way traffic. And this new investment traffic from China to UK is moving on a fast track. 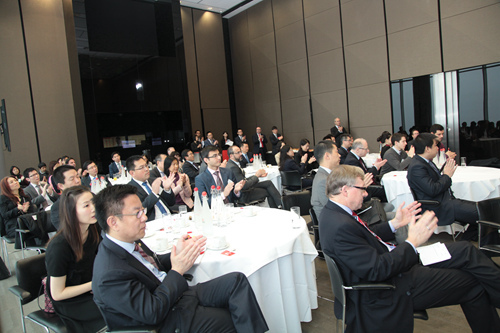 Chinese enterprises are showing a continuous and increasing enthusiasm for investing in the UK. And the UK has become one of the most important destinations for investment from China. These investments have four major features. 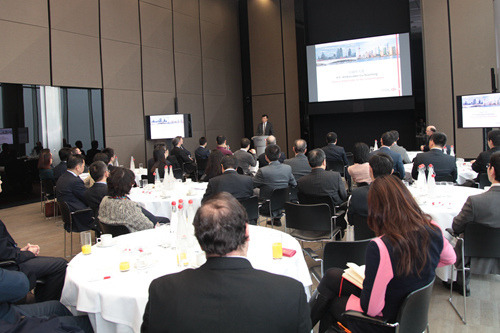 · Chinese investment and M&A in Britain now totals close to 40 billion US dollars. · Britain became China's biggest investment destination in Europe in 2012 and 2013, absorbing over 13 billion US dollars worth of capital from China. · In the first ten months of this year, the contract value of Chinese investment capital in Britain was over 6 billion dollars. This is more than the entire amount for last year. · Chinese investment has found its way into high-end manufacture, R&D, infrastructure, brand network and commercial real estate markets in Britain. · The investment flow is constantly extending the industrial chain and moving up the value chain. · China Investment Corporation sounded the clarion call for infrastructure cooperation with Britain by buying shares of Heathrow Airport Holdings. · Wanda, Xinbai, Geely and Bright Dairy & Food acquired well-known British brands. · Huawei, Chang'an and Shanghai Automotive Industry Corporation (SAIC) set up R&D centers in Britain. · And CNPC, Sinopec and CNOOC have all participated in North Sea oil projects. · Private enterprises are playing an increasingly important role in investing in Britain. · Shandong Yongtai, NVC lighting and Blue Focus Group all have grown stronger to be able to compete with SOEs. · In addition to contributing to economic recovery in Britain, Chinese investments were also well received locally. · Chinese investment has helped save some of the British companies from bankruptcy and create jobs. · According to UKTI statistics, Chinese investments helped secure and create 5,450 jobs in Britain in 2013. · China is Britain's fourth largest job creator of all countries and regions. · And China is the number one job creator in UK among the developing countries. · Chinese outbound investment stock accounts for only 2.5% of the world and one tenth of the United States. · China's overseas net assets are only half of that of Japan. · The number of Chinese enterprises that can compete with advanced multinational companies remain few and far between. · Chinese enterprise going global still has a long way and many years of practice, exploration, and trial and error ahead of it. However, as we look ahead, we have confidence in accelerating the pace of outbound investment. The Third Plenum of the Eighteenth Central Committee of the CPC has given clear-cut encouragement to outbound investment. The enterprises are identified as key players in outbound investment. The Third Plenum has also decided on reform of the outbound investment approval regime. The Fourth Plenum a year later introduced a number of measures on improving the legal system. Foreign-related legal systems will be updated. This means adapting to the continuous deepening of opening up and to facilitate the building of a new system of open economy. Legal services will be strengthened to safeguard the legitimate rights and interests of Chinese nationals and legal persons overseas. According to State Council requirements on delegating government power, the Ministry of Commerce, NDRC and other relevant departments have recently introduced new measures on outbound investment administration. These measures have substantially reduced the number of items subject to approval and created a more relaxed policy environment for outbound investment. This means that the 'sails are set and a favourable wind is blowing.' So, I urge enterprises in China and UK to seize this new opportunity. They need to explore the British market and bring in Chinese equipment, technologies, capital, brands and services for the benefit of both. · Protecting the rights and interests of employees. · Building a strong company culture. · Giving back to the local community. And at the same time, they should also work as Chinese cultural envoys to enhance understanding of China among the local community. Here at Canary Wharf, one third of global maritime trade used to take place in Victorian times in the UK. But, with the rise of the container shipping industry, the sea traffic moved way down river. All that remained by the 1980's were derelict docks. Today this historic dockland area has been utterly transformed. Through a focus on financial services, Canary Wharf has made a successful transition into a key global financial centre. It is now a major landmark of London. Likewise, China-UK economic cooperation and trade needs to make its own transition. Here, inspired innovation is needed. Cooperation must be upgraded to broader areas and higher levels. I am confident that we have the resources and goodwill to succeed. With the joint efforts of business leaders, Chinese enterprises will be able to take more solid steps, make more steady progress and go farther on their outbound journey.